Following the devastation caused by the cyclone in the Pacific, we know that many in the parishes will want to give to help the relief effort. AMB is commending the CWS Appeal for this purpose. Donations can be sent to CWS via their website, by credit card or by post. Update: CWS Sends $20,000 for immediate relief. Donations are still required. 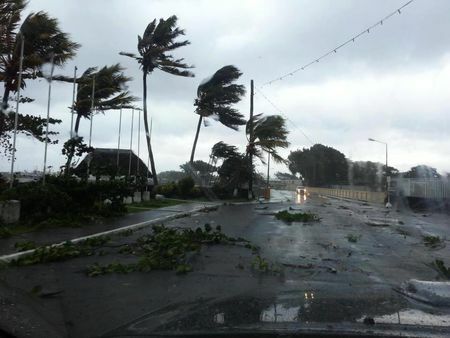 Samoa and Fiji need immediate and long term help to get back on their feet after Cyclone Evan’s destruction says Christian World Service national director, Pauline McKay. CWS have launched an appeal for donations for partner and associate groups in Samoa and Fiji. “There is a common need for both to get immediate short term help with food, shelter and repairs followed with a longer haul need to look to issues like crops, livelihoods and incomes’’ said Ms McKay. In both cases the need for the partners was for cash, not goods. “They know what they need and initially it’s as practical as food, tarpaulins spades, and in Samoa’s case chainsaws to clear away all the fallen trees. “They can buy supplies locally but they need money to do so,”’. Food would become a problem in both Fiji and Samoa. In Samoa CWS associate group The Family Centre were reporting that the banana crops had been almost destroyed, breadfruit trees stripped of fruit and the older trees looked like they may take years to recover. Within days villagers would need to use what they could of these crops and would then need to buy in food like rice in the months ahead. Fuel for generators when available would also be needed with some rural areas likely to be without power for many weeks. A similar picture would emerge when CWS’s Fiji contacts were able to get through once their power and phone infrastructure was up and running again. CWS is working with its partner group in the informal settlements without secure land tenure. Their lives are close to subsistence at the best of times and the informal settlements are often close to rivers and low lying land. A number of them are close to the Nabua River which has flooded badly. CWS development worker, Trish Murray said that on a recent trip she had been shown the flooding marks on the top of a hospital’s doors in such an area. The impact of Cyclone Evan on such areas after a year when there had already been floods is likely to have a major effect on family and community income and resources. Donations to help Pacific people hit by Cyclone Evan in Samoa and Fiji can be made directly to CWS. or by calling 0800 74 73 72. For further information contact: CWS National Director, Pauline McKay.